Hand made with love, take a look at our fantastic range of Dog Coats, new for last year and now available online, designed to keep them dry while giving them that sophisticated look out and about in the country or around town. Hand made with love, take a look at our fantastic range of Dog Coats, new for last year and now available online, designed to keep your dog dry whilst giving them that sophisticated look out and about in the country or around town. Our stylish dog coats are lightweight, reversible and designed with a waterproof microfibre and a soft fleece lining available in a fantastic range of designs!! The coats are designed to be reversible, if it is raining then the fleece is a warm, cosy lining for your dog whilst the waterproof microfibre ensures they stay totally dry and protected and if not, the colourful fleece lining can also be worn on the outside to give a chic and sophisticated look, the choice is yours!! All of our coats have been designed with velcro fastenings around the neck and underside of your dog to keep them safely secured... even for the most active of dogs! This fitting is extremely easy to put on and takes just a few seconds to whip off and turn around should it start to rain or snow. There is a small buttonhole on the coat just below the neck to allow you to attach the lead to your dogs collar underneath the coat, the top of the coat neck then folds neatly back to cover the buttonhole. To ensure you pick the correct size coat for you dog, take a look at our Dog Coat Size Guide at the bottom of the page. If you are not sure of your dogs size or need a dog coat made specifically for your best friend to fit their specific measurements, please dont hesitate to drop us an email at sales@kocokookie.co.uk and we can custom make a coat just for you! 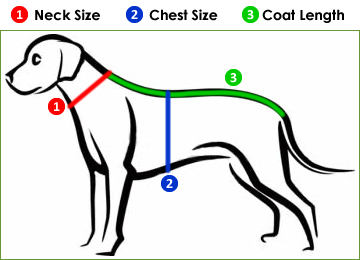 When selecting your coat size there are three important measurements you need to take from your dog to ensure your Kocokookie coats fits them perfectly, the size of thier neck, chest and finally the length from the top of their neck to the base of their tail (see the diagram below). You can then compare these measurements to our size guide below to determine the correct coat size for your dog. If you are not sure of your dog's size or need a dog coat custom made for your best friend to fit their specific measurements, please don't hesitate to drop us an email at sales@kocokookie.co.uk and we can custom make a coat just for you! You can also see some colour samples of the waterproof micro fibre and fleece lining below (exact colour may vary sligtly).